Get Ready. Get Set. Get Luggage! I once had a friend who spent $3,000 on a luggage set. The reason for this was the two initials it came with were all the rage in the world of “design”. Plus, she wasn’t even due to travel! When I heard about this, I spent quite some time thinking about what I could do with $3,000 that would be way more valuable to my life than a set of luggage. From my seemingly never ending search for the correct set of luggage, I’ve found that sets run the gamut from barely $40 to well over $1,000. I’m sure it can even get more expensive than that if you start looking for designer labels and exclusive patterns. That said I’ve never really cared about labels. For instance, I wear clothes I think are pretty and comfortable because that’s what important to me, not the label! It seems that luggage also gets marked up like clothing just for having someone’s name on it. There are companies that are world-renowned for making luggage, but it seems the more you learn about them, the more the quality has gone down over time. If we decide to invest in a whole set, I worry that we’re going to have to spend a whole lot of money to get a set that is worth its salt. I don’t want to invest thousands of dollars in luggage (and I’m sure you don’t either)! So, I went on the search for a complete set that wouldn’t break the bank. 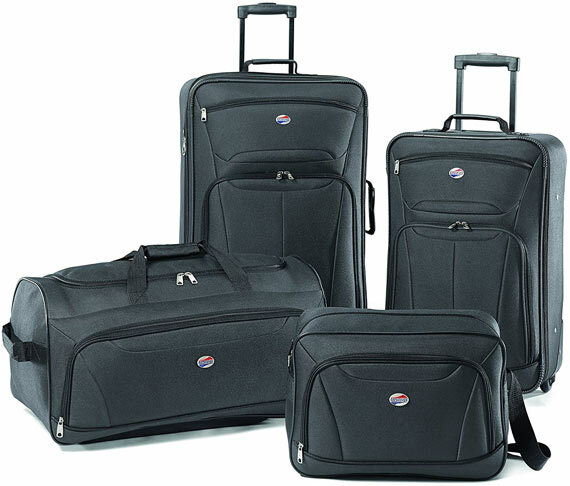 I looked into the American Tourister Luggage Fieldbrook II 4 Piece Set because it has 4 matching pieces in plenty of available colors, and the whole set comes in at just under $100. For less than $25 per piece, it could be a set that lasts for a long time while still making me feel secure about the amount I had to spend on it. I don’t mind saying I’m pretty cheap, and I don’t like spending money if I can avoid it. The Fieldbrook II Set is made to be sturdy and rugged. The design offers reinforced corners that can withstand the damage that comes from regular use as well as being tossed around through checked baggage (we all know that happens)! The largest suitcase is expandable which is great for holding all the goodies you’re likely to pick up on a trip. For some reason, when I pack, it all fits on the way there, but I have trouble getting the case shut on the way back (you know what I’m talking about). So, I think the extra two inches will save a lot of time trying to squeeze one last thing into the suitcase. One of the biggest drawbacks that I quickly caught onto for this set is that it provides a carry-on sized duffle. I’m not one for carrying packed bags through the airport on my shoulder. I would have to get a separate rolling carry-on bag, which would just add to the overall cost. The duffle does have some wheels, but lacks the convenience of an expandable handle and ease of use when you have to get across the airport quickly. The slight negative above may be a “put off” for some of you, but if you don’t beat up your luggage and you’re not fussed about having the convenience of a rolling carry-on this set might just do the trick.